To a casual observer, it may not be obvious that Martin cared about (or wrote much for) younger audiences, but the reality is a little different. He had a lifelong interest in classic children's fiction—especially his own childhood favorites, from Alice to Oz—and for many years had a day job editing and creating material for young readers. 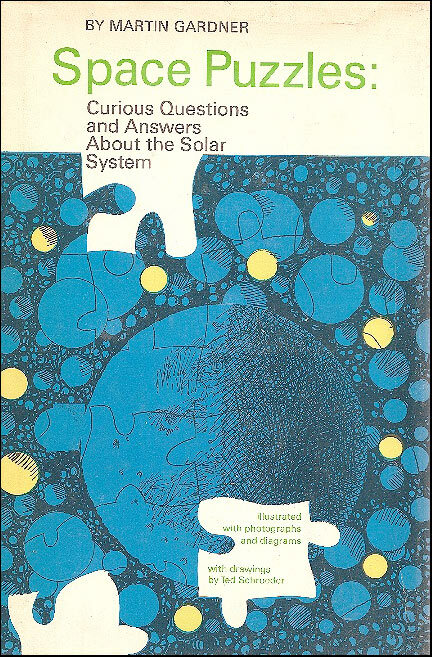 Most importantly, he left a good dozen books that can be enjoyed by children today, encompassing puzzles, mathematics, science, astronomy, verse, magic, wordplay and optical illusions. 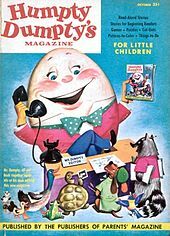 Having moved to NYC in 1947 or 1948, and tried to eke out a living as a freelance writer, Martin started a regular job in 1952 as contributing editor for Humpty Dumpty's Magazine for children. As he recounts on page 129 of his memoirs, this was one of "a line of pulp magazines for youngsters" put out by Parents' Institute. In that job Martin found himself writing a poem and a story each week as Humpty Dumpty Jnr, "for eight happy years," as well as devising a great deal of activities that involved paper cutting and folding. 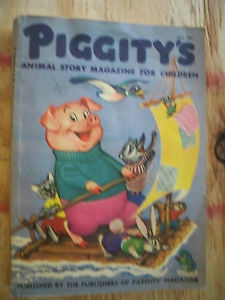 He was also the Managing Editor for Polly Pigtails magazine for girls for a while years, starting with the first issue in Spring 1953, and served in a similar capacity for the short-lived Piggity's . 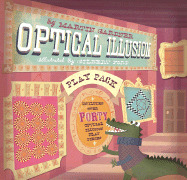 In 1959, he published the first of several collections of puzzles or magic tricks aimed at children, suitably illustrated. 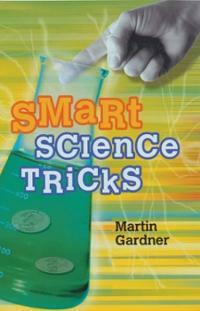 In his Martin Gardner Presents (1993) he wrote, "I've often thought about writing a book on magic for five-year-olds. I'll probably never get around to it...", and this prediction turned out to be correct. Some of the material in the books listed below can certainly be read to very young children. 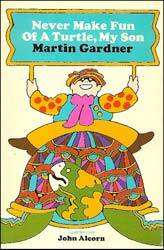 Indeed, as Martin comments in his memoirs in connection with the Humpty Dumpty's Magazine material, "It was assumed that both the story and the poem would be read aloud by a parent." It's in the spirit of that broader sense of "childrens' books" that the list below it offered. The items are presented chronologically, by publication date. We've not listed any of Martin's Annotated Alice books, as the annotations are probably of more interest to older readers. 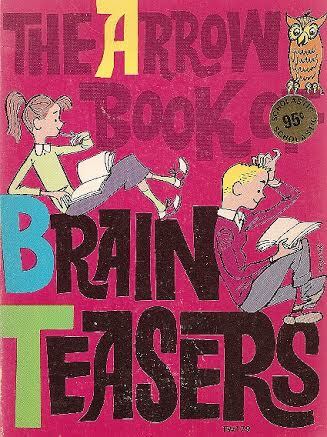 In the mid 1990s, this book was reworked as Classic Brainteasers (Sterling, 1994, 96 pages, illustrated by Jeff Sinclair), with many of the puzzles tweaked. The Arrow series of books published (and promoted in schools) by Scholastic Book Services was specifically aimed at grades 4, 5, & 6. 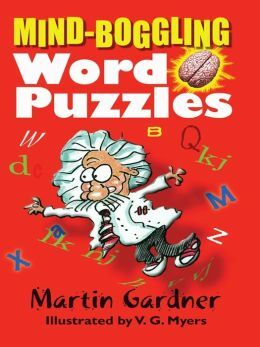 Delightful word puzzles, riddles, and visual illusions are mixed in with "spot the error" headscratchers and teasers about science, knots and counting triangles and squares. Mathematical results about the graph K3,3, Eulerian circuits, the permutation group on 3 objects, and the maximal number of pieces a disc can be cut into with 4 straight cuts, as well as the pigeonhole principle, are sneaked in unsuspected. 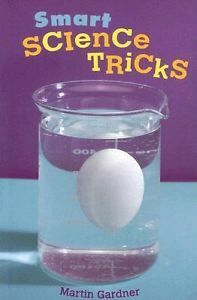 This was republished two decades later under the title Entertaining Science Experiments with Everyday Objects (Dover, 1981). 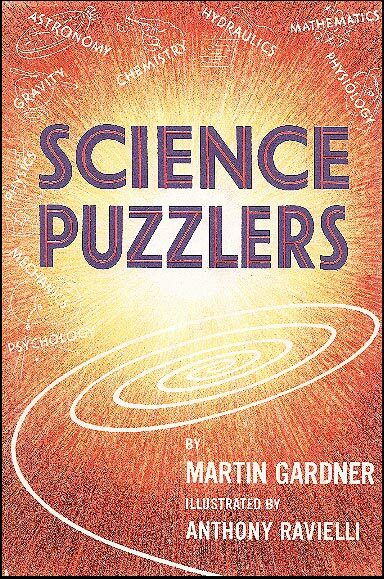 Martin loved astronomy, physics and basic science, and he excelled at introducing physics principles (and related magic) to audiences of all ages with apppropriate puzzles and effects. This contains 100 entertainments organized into these chapters: Astronomy, Chemistry, Physiology, Psychology, General Mathematics, Topology, Probability, Geometry, Numbers, Light, Gravity, Static Eletricity, Mechanics, Air, Hydraulics, Heat, Sound, and Inertia. The presentation is nowhere near as daunting as those categories suggest, being informal and very much aimed at younger readers. 3. 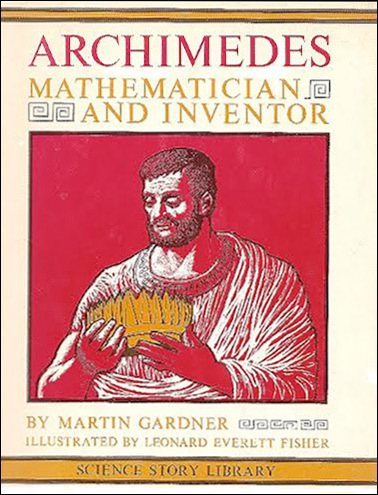 Archimedes, Mathematician and Inventor (MacMillan, 1965, 6 + 42 pages, illustrated by Leonard Everett Fisher). "The Romans were not much interested in science and mathematics, and more than a thousand years were to go by before there were any scientists as great as Archimedes. The world has long ago forgotten the name of the hot-tempered Roman soldier. It hardly remembers the names of King Hiero and Marcellus, the general. But the name of Archimedes has never been forgotten. Today, in every country, his great discoveries are known and his name is honored." In later life, Martin often echoed the sentiment than great scientists made a deeper impression on world history than kings and generals. This is a collection of "morals for children" poems that Martin wrote for Humpty Dumpty magazine in the 1950s, here appearing on right-hand pages, matched by appropriate artwork on the facing left-hand pages. Titles include Barbershop, Share Toys, Cry-Baby, Speak Clearly, Medicine, Good Sport, Bedtime and Politeness. "Imagine the earth reduced to the sze of a billiard ball and dried with a towel. You run your fingertips over the surface. Would you be able to feel its mountains and ocean floors?" 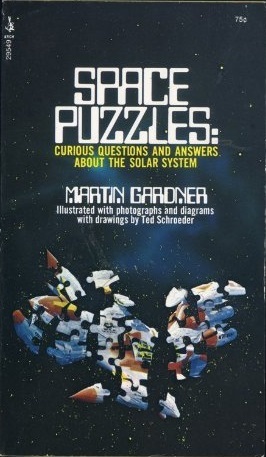 This was Martin's editing for a new generation of a book of which he said, "No better collection of puzzles for young children was ever published." In his memoirs, on page 130, he writes of his admiration for the work of art editor George Carlson in John Martin's Book. "During the twenties it was the delight of my childhood, mainly because of a Carlson page called Peter Puzzlemaker." 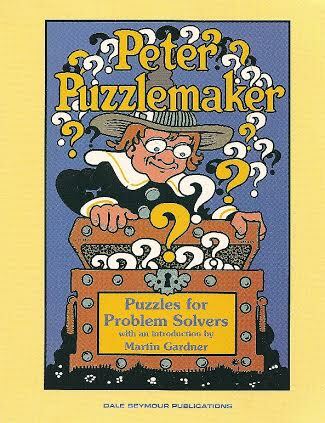 He edited a second Peter Puzzlemaker book in 1994. 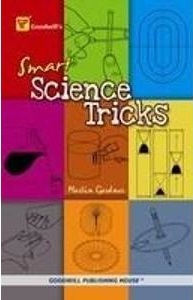 This is subtitled "Surefire Tricks to Amaze Your Friends." Its 89 predictive items range from simple gags and forces with words, cards, dice and calculators, to classics by Bob Hummer, Paul Curry, George Sands, Max Maven, and Karl Fulves, as well as Jim Steinmeyer's "Nine Card Speller" from 1993. While the material is seemingly aimed at a young audience, much of the material is far from juvenile. 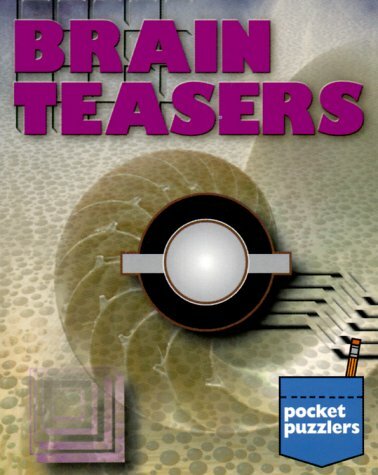 These 103 items range from riddles and visual effects with letters and words to palindromes, rebuses, crosswords, and anagrams. It was reissued by Dover. About half of the 95 items here had appeared in Martin's long-running "Trick of the Week" feature for The Physics Teacher magazine. The book is divided into seven chapters: I. Water, II. Motion, Inertia, Friction, III. Air, IV. Light and Mirrors, V. Optical and Sensory Illusions, VI. Mathematics, Sound, Physiology, and VII. Electricity, Magnetism, Gravity. The presentation is bright and breezy. Even in his earliest puzzle collections, Martin had included optical illusions, those being a keen interest of his all his life. 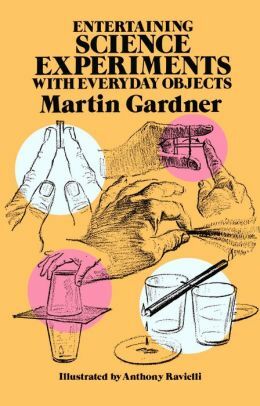 Illustrator Gilbert Ford realized Martin's ideas, some of which reached back to his "Humpty Dumpty" days in the 1950s, involving cutting and folding of paper or cardboard. Other contenders, which could just as easily have made the above list, are Codes, Ciphers, and Secret Writing (Simon and Schuster, 1972, 96 pages), Science Magic: Martin Gardner's Tricks and Puzzles (Sterling, 1997, 98 pages, reissued as Science Tricks), or Visitors from Oz: The Wild Adventures of Dorothy, the Scarecrow, and the Tin Woodman (St. Martins, 1998, 16 + 189 pages, illustrated by Ted Enik), Martin's affectionate updated Oz fantasy, which sees Dorothy and friends visit a topologically-challenging earth in a modern age—featuring email and Oprah Winfrey.